EXAIR’s 1/8 NPT small external mix spray nozzles atomize fluids up to 25 gallons per hour. 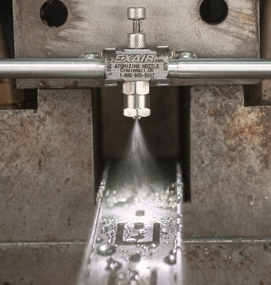 EXAIR’s new 1/8 NPT small external mix spray nozzles atomize fluids up to 25 gallons per hour. External mix nozzles are great where a high volume of liquid is needed. They can be used on liquids with a viscosity up to 800 centipoise. Small external mix nozzles are available in a narrow angle flat fan pattern and are the best choice when a thicker liquid needs heavy application over a narrow band. They combine liquid and compressed air to create a coating of liquid that can be easily adjusted to meet the needs of your application. EXAIR atomizing nozzles are also available in 1/4 and 1/2 NPT. A variety of flow patterns and liquid rates are available to meet your needs. Internal mix and siphon fed atomizing nozzles are available too, as well as patented no-drip versions of every atomizing nozzle.